The Rev. C. D. Witherspoon, a leader of the Baltimore People’s Power Assembly, and former president of the Baltimore Southern Christian Leadership Conference, speaks to the Unity March on Jan. 14. Less than 24 hours after the Senate took the first steps towards utterly obliterating health care for vulnerable U.S. residents, community activists assembled in the sleet-slick streets of Baltimore, beneath darkening skies, to kick off the fight against the latest reactionary administration: that of billionaire fascist Donald Trump. 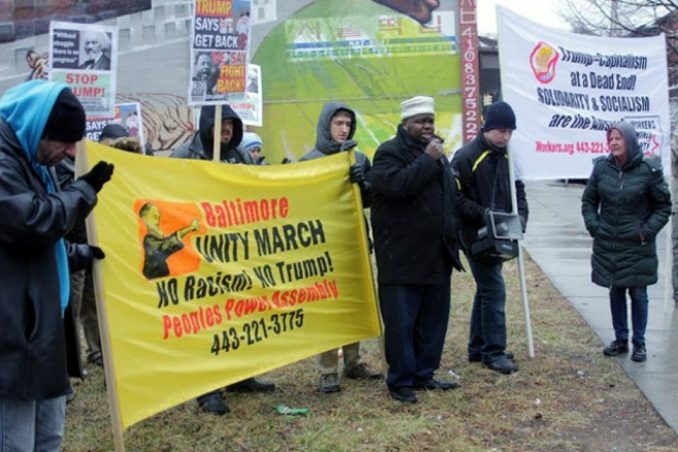 The Unity March, organized for Jan. 14 by Workers World Party and the People’s Power Assembly, commemorated the birthday of Dr. Martin Luther King Jr. by challenging the encroachment of Trumpist policies of reaction on the national and local levels. 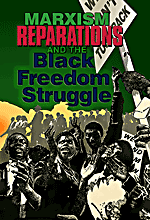 The city and business interests have attempted to associate Lexington Market with violent crime and drug abuse in an effort to obscure the systemic oppression of Baltimore’s poor and working class — oppressions they share with the most vulnerable populations across the country and the world under the auspices of global capitalism. As we move into the era of Trump, community action on both local and national levels becomes more crucial than ever. “There’s not gonna be a ladder coming down from Washington,” said Witherspoon. “There’s not a ladder coming down from Annapolis [the state capital], and we’ve discovered here in Baltimore there’s not a ladder coming from City Hall.